An Archcore steel structure can be designed for a one car or two car metal garages and still have plenty of room for work benches or general storage. Since the roof has no trusses or framework the interior space is 100% useable. You can easily build full height storage racks against the straight side walls or create a loft for a second floor apartment or general storage. Don't worry about birds or rodents residing in the roof because there are no rafters for them to nest and breed in. If you want your pre-fabricated garage building to match the appearance of other buildings or the surroundings, the arch spans provide incredible strength which allows the end user to customize their endwalls with a simple stud wall and any type of architectural features. You also have the option to pick from any of the Archcore Energy Star colors to complement adjacent buildings or match your house. They are totally pre-fabricated so you can do the erection yourself with just a couple buddies and save construction time and labor cost. Archcore's versatility makes it simple. 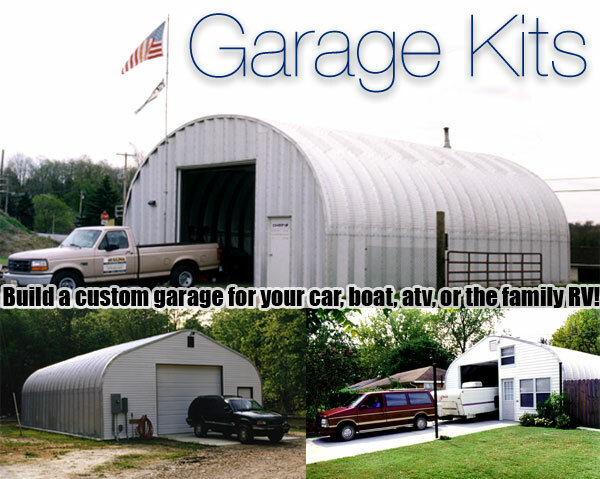 With our all steel garages you can easily create your own dream garage. The heavy gauge Galvalume steel design means the buildings are maintenance free and built to withstand extreme weather conditions. Every pre-fabricated building kit has been engineered to meet your local structural codes so you can feel confident they will be there to guard your vehicles and valuable possessions. The steel is guaranteed by the manufacturer and the steel mill against rust for 35 years so you can spend your time working on your hobby cars and not fixing building problems!! Archcore steel garage kits are easy to erect, affordable and will provide you many years of peace of mind while your vehicles remained secure and protected against the elements.